This is one of my all-time favorite paintings. I feel I really got this beauty pretty well, and I just love the soft coat of this breed. The original, 8x10", is still available on my website, as are my pendants and earrings. 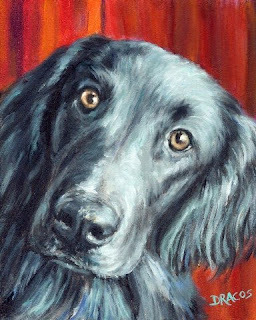 I was also contacted today about doing a liver-colored flat-coated retriever, which I'll be doing in just a few more weeks, after I finish up some other commitments first. This breed was unknown to me until fairly recently, and I think it is an absolutely beautiful breed. I can't wait to see how the liver-colored one turns out. 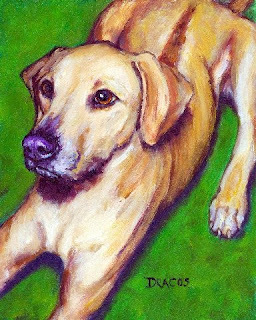 This is a painting of my own precious, precious dog. It's even hard to this day for me to talk about her, so I won't say much at all. Her name was Labua, and she was one the sweetest dogs I've ever had the privilege to share a few years of my life. That's enough.